Happy Monday everyone! In my neck of the woods this weekend it was hot hot hot!! My kids were red faced by the 3rd minutes of their soccer games. We spent all day Saturday on the soccer field and all day Sunday at the pool. It was nice! 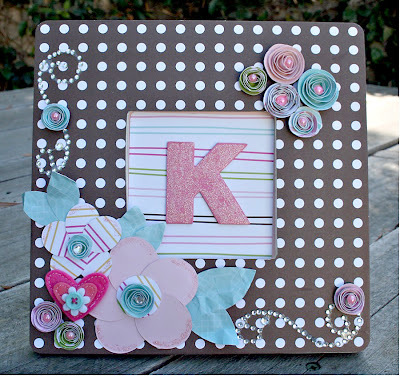 I have another altered frame to show you today. I made THIS ONE for my daughter and took some inspiration from that one for this one. Scraplifted myself, I guess you might say. 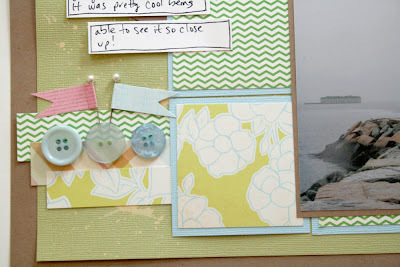 This was another dollar frame from the craft store that I had in my stash. I used some great Bo Bunny Crush papers to make this one pink and black and super girly. 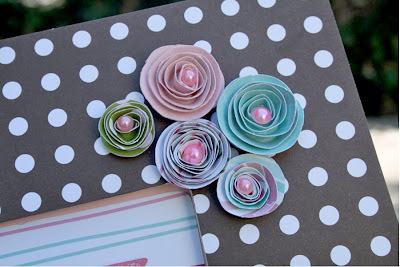 I am in love with these rolled flowers and I seem to be making them quite a bit and putting them on everything. I also used some Smooch accent ink to rim the flowers. 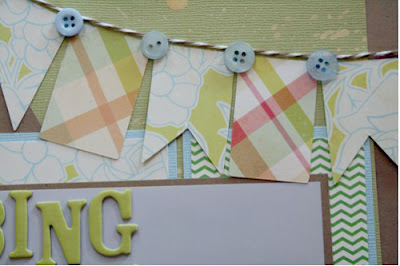 I used my Cricut to cut out the triangles for the banner and the curly pieces. I am loving my Cricut right now, too!! 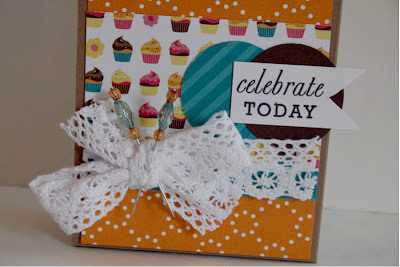 Lots of my favorite things on this frame right now...bling, rolled flowers, ribbon, and baker's twine!! 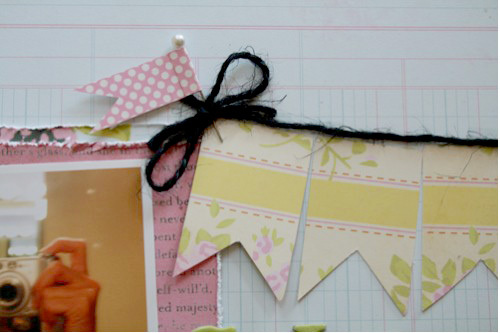 And if you are looking for a great design team to be part of, please check out Scrapbook Express. They are a great store and are having a Design Team Call right now!!!! Please go check out all the details HERE. You don't want to miss this opportunity. Happy Friday!! We start soccer season tomorrow morning. Bright and early, we have a game at 8am. The Blue Lightening and Purple Pandas will be looking for their first wins tomorrow! 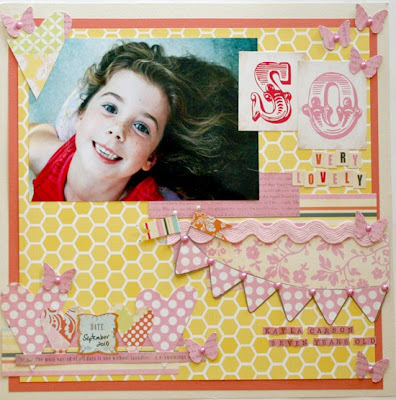 I have one more layout I did with the August Citrus Tree Studio kit. I loved this kit! So, I confess. I take photos of myself in the bathroom mirror. I was just messing around one afternoon with my small point and shoot camera and found myself with all these self portraits. The lighting was totally off, that's why my face looks orange. It's not from too much self-tanner. But I thought they were cute and I rarely scrap myself, so I used them. The kit came with a big sheet of all these little words. I used some that I thought described me. I especially love the 'candy' sticker. And I used every single last stick pin flag that came in the kit. LOVED them!!! Did that post title catch your attention? I think i'm in trouble. All summer...I didn't feel like baking. At all. I didn't want to turn on the oven, or dirty a bunch of dishes. 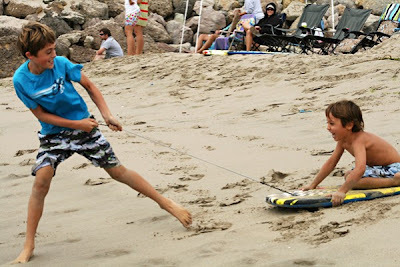 I had games of tag to play and sunshine to enjoy and bikins to fit into. Plus I didn't feel like being in the kitchen after I cleaned up dinner, since after dinner is when I usually ignore my children and bake. 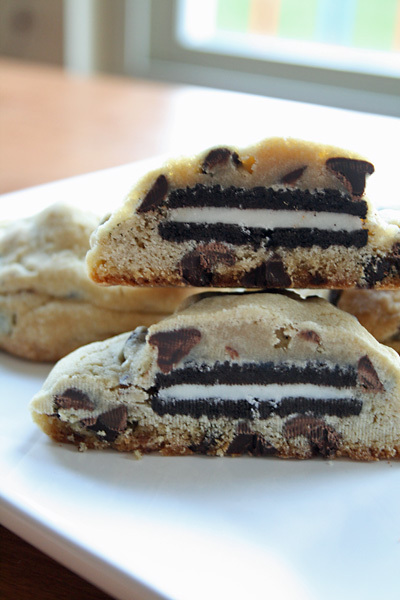 But the feeling is coming back, the itch to bake. And that's when the trouble begins! I started off the baking season with a bang...these little delicious bars. 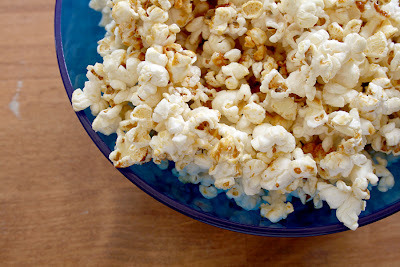 If you have never been over to the Picky Palate food blog, you are missing out. Her recipes are easy and delicious. 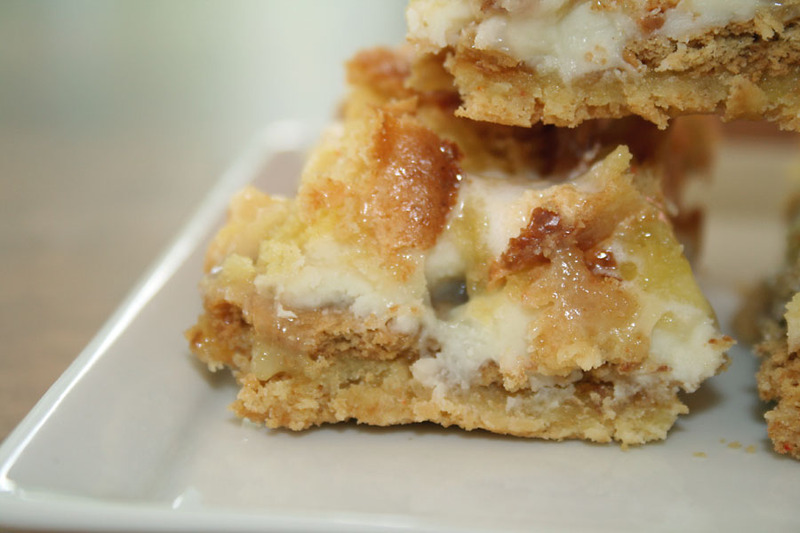 In the most ooey, gooey, marshmallowy, sticky, best way imaginable. Layer of cake, then graham cracker, then white chocolate, then marshmallow, then cake again. 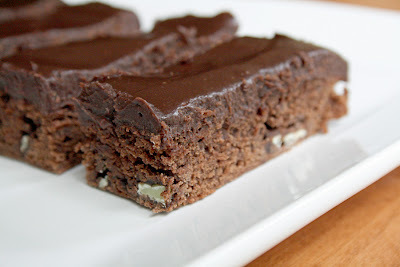 These were a pretty great way to get back into the kitchen!! Please head over to the Picky Palate blog so you can try these for yourself: White Chocolate S'mores Gooey Cake Bars. Sidenote: Make sure you spray the pan really really really well with cooking spray. 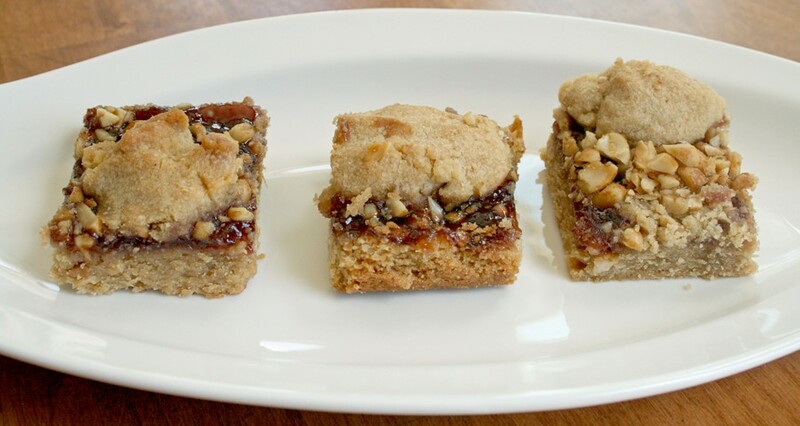 I did a decent job and the bars were very sticky and hard to get out of the pan. There was some collateral cake damage on the sides...but don't worry I found them a good home. In my belly. 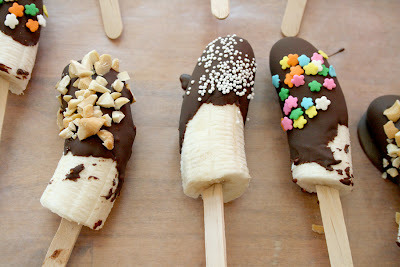 Remember this post a few days ago, about Back To School Treats? Some of those treats would be nice teacher gifts, perhaps, for the first week of school. 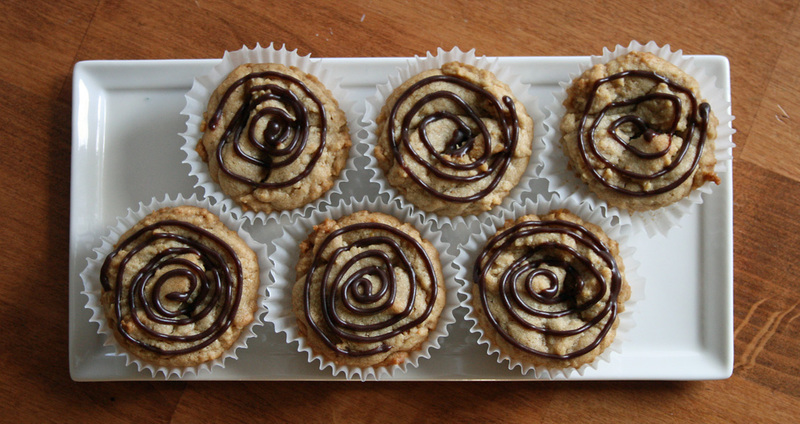 And when you spend the time to make some homeade treats, you want to package them up all nice and pretty! I used the PSA Essential Super Star set for this bag and card. 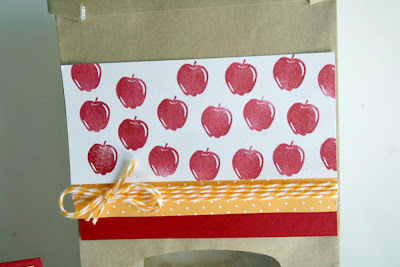 I repeated the apple stamp all over the card and added a fun You Rock sentiment. And a big tied red bow because I think they are pretty. I also stamped the apples to tie in the gift bag. Some baker's twine and matching yellow paper round out the bag. See my fun uneven stamping? I was trying to make it look uneven and distressed. Really, I was. I also double tied my baker's twine. Because you really can never have too much baker's twine. So make something yummy, then package it up all nice and yummy. It's a win-win. Sunday night...all is quiet in the house...another work week, first week of school for my husband (he's a teacher) and my kids, new teachers and new homework, soccer scrimmages, first soccer games on Saturday...This coming week will be busy busy busy I am sure. So i'm enjoying the quiet while it lasts. 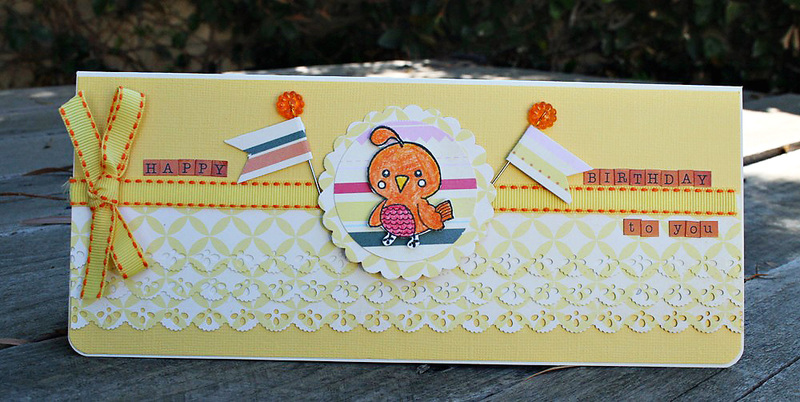 If you have a Cricut and you have the SCAL software, I highly recommend the templates from My Scrap Chick. She has a set of bag templates that I use all the time. In fact, here is one now! I used the Confetti line from America Crafts to decorate the front of the box. 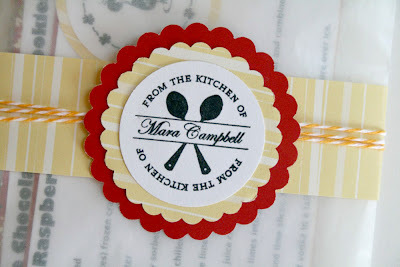 I love the AC lacy ribbon and I added some cute Jillibean Soup stick pins! And a pinwheel on a stick...what says birthday more than a pinwheel on a stick? No?? I love having projects like this already completed. So when I remember at the last minute it's somebody's birthday, I already have a gift bag ready to go. 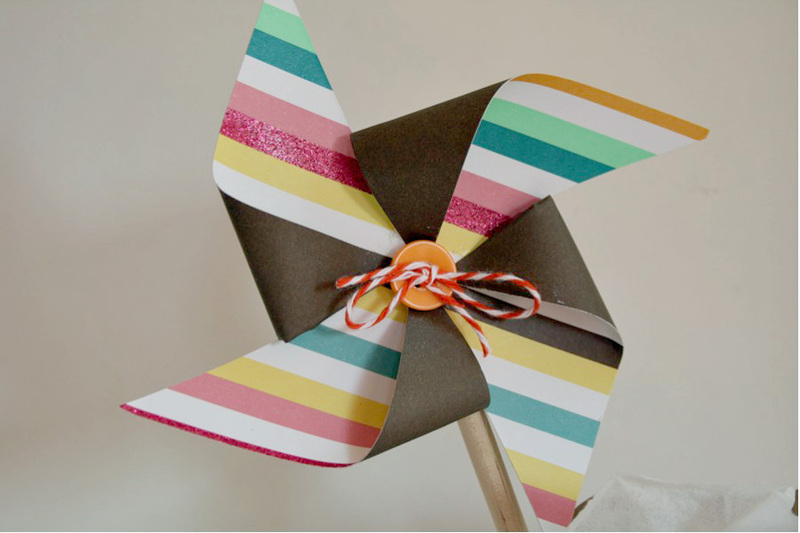 And a pinwheel. 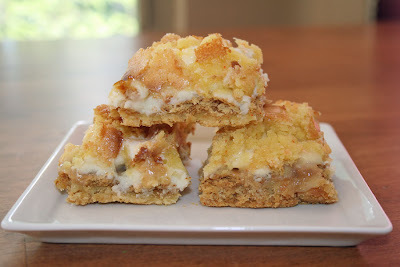 If you want the recipe to any of the above goodies, click on the name link and it will take you my original post where I have the recipe. 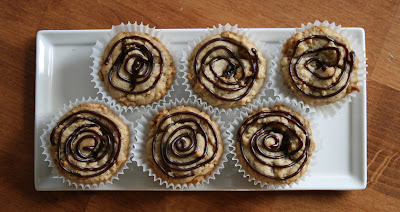 Even if you don't have kids that are going back to school, there is always time for a little baked goodie in your life! 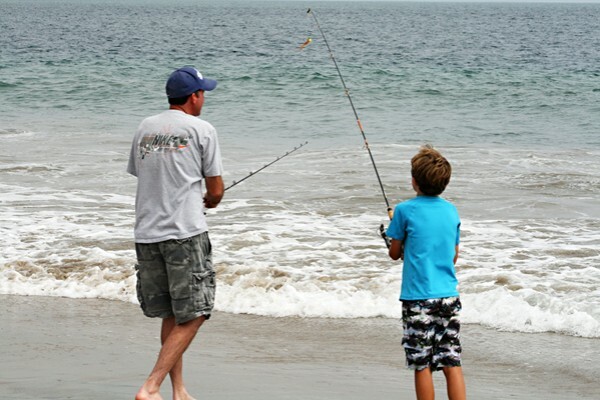 I know Father's Day was quite a few months ago, but I still had not scrapped our photos from the day from 2010. Yes, I'm behind. 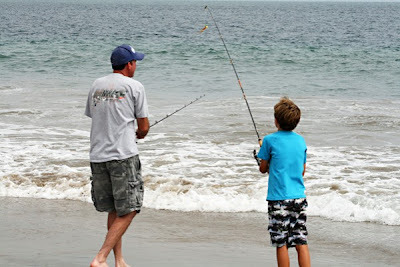 Lucky for my husband we were back east for Father's Day. And he got his wish to see the Dodgers play the Red Sox at Fenway Park. It was a great day. We sports bar hopped before the game, waiting out a torrential downpour and had fun sitting by the Green Monster. It was a great day! As soon as I saw that strip at the bottom on the sketch, I knew I wanted to try rolling some paper. I have always wanted to do this paper technique and this was my lucky day. Isn't that fun?? I loved it. I cut the paper into strips and then just rolled them up tight. I used some Helmar liquid adhesive to hold the end together and it worked great. Hopefully I will remember to do this again sometime! Happy Wednesday everyone...thanks for stopping by!! We are a camping family. We tent camped for many many years and always had so much fun. My daughter did some of her first crawling in a tent. 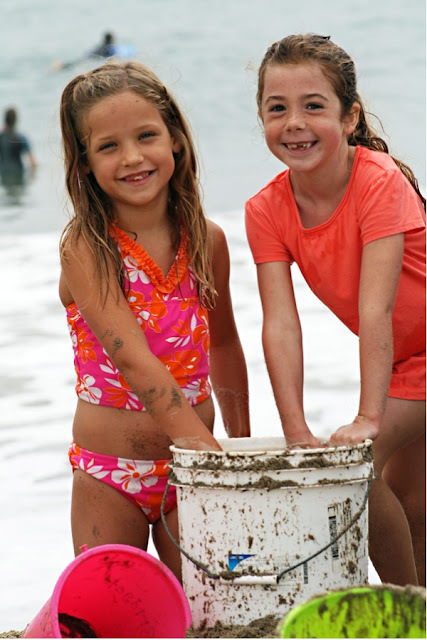 We've had great trips to the beach, Mammoth Lakes, Sequoia National Forest, Lake Tahoe. A few years ago we invested in a used pop-up tent trailer and we are loving it! We spent the last weekend beach camping with 3 other couples. It's so fun camping with friends because my kids have friends they can play with and the adults actually get some adult time. It's a total win-win. We used to have to watch our kids every second when camping so it's nice they are older and can sorta do their own thing. Don't worry, we still feed them. And going right back out!! And don't worry, there were other adults watching in case she couldn't get out of the wave washing machine. She was an animal. 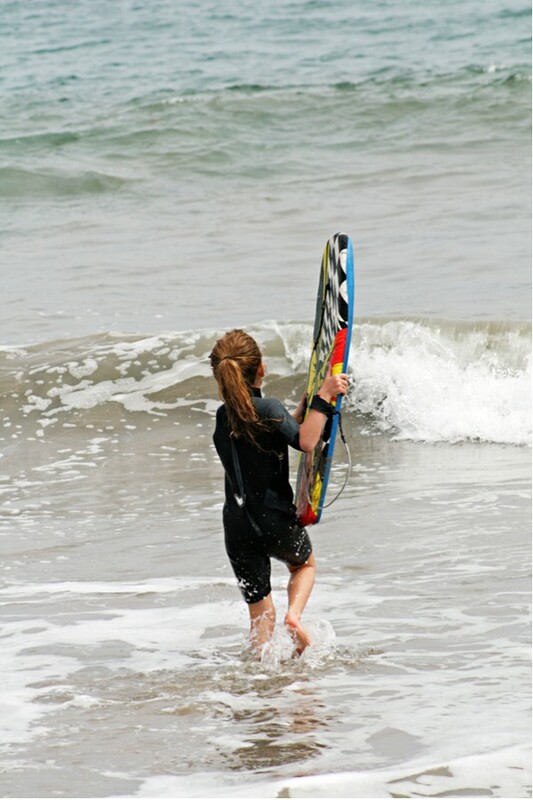 I think I should seriously consider some surfing lessons for her birthday. She would absolutely love it!! I hope you all had a great weekend! My kids have one more week before school starts. Hope you're enjoying the last weeks of summer. Thanks for stopping by! Happy Thursday everyone!! 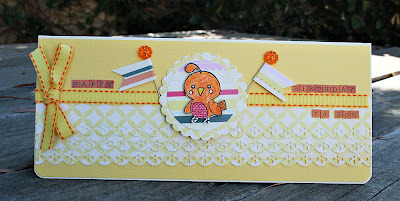 We have new challenges at Citrus Tree Studio this month and mine is a grid challenge. As in...make a grid on your layout. I used the August Picnic In the Park kit for this layout. I used the patterned paper and blue cardstock to create 3 inch squares for my background grid. I also used some cute flags that came in the kit. And added a banner! Surprise, surprise!! Now let's see what you can do with a grid. Make a background grid or a grid with your photos. 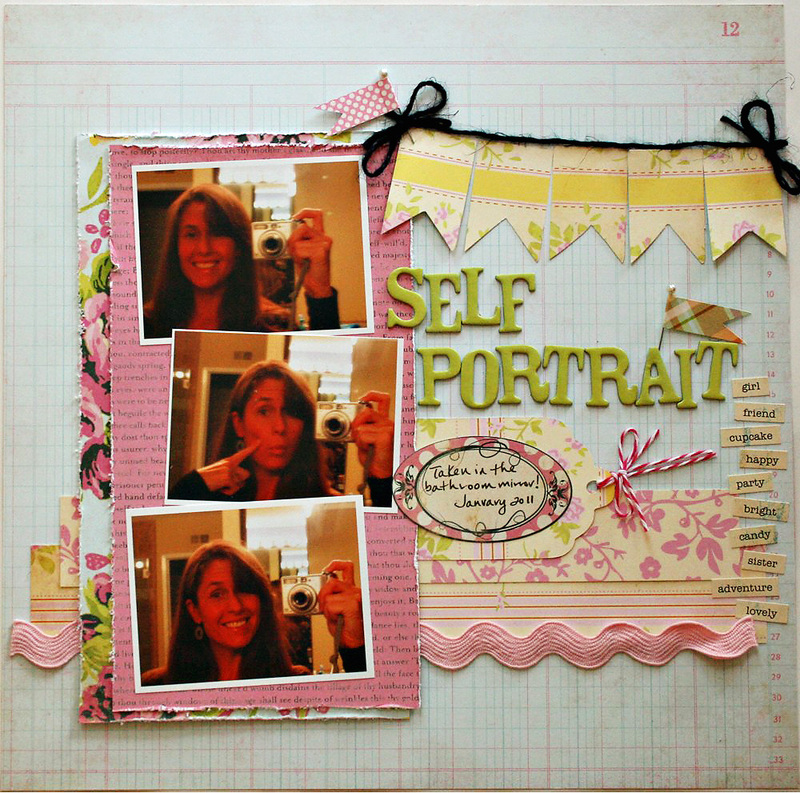 Upload your layout to the CTS gallery and come play along with us this month! I am leaving tomorrow for one last beach camping trip for the summer. I will catch up with you all when we get home in a few days. Thanks for stopping by! 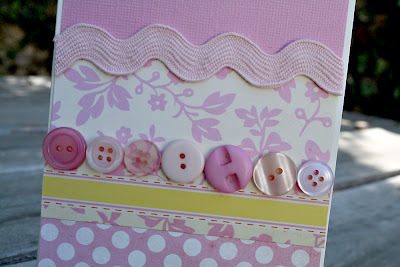 In the August Citrus Tree Studio kit, I received some blank cards. Which I usually love, but these were an unusual shape. They were long and tall. A shape I don't normally make cards with. So I stared at them for a while before I decided I was going to actually use them. I loved the cute bird stamp!! I cut the clouds from my Cricut, but you could easily cut them by hand. I had to add some buttons, too. Because buttons, much like chocolate, make everything better. Okay, one more card. I put my border punch to good use on this one. I ran out of flags that came in the kit, so I made my own using stick pins from my stash and paper scraps. I'm not super happy with the placement of the flags, but it is what it is!!! Hope you're having a great week so far! I can't believe the summer is winding down. School starts for my kids in 2 weeks and soccer practices started today. Bring on the busy. Thanks for stopping by today. Last month I made this banner for my son. And wow, was my daughter jealous that it wasn't for her!! I promised to make her a banner for her room, but I wasn't feeling another banner. So I dug through my box of stuff to alter (I know you have one, too!!) and found some wood frames I had been hoarding. I just can't walk through Michael's and NOT pick up a few $1 wood frames. I dug into my Pebbles Ever After papers and I got to work! I cut out some balloon shapes on my Cricut to make the petals for the flowers. I added some Stickles on the edges for a little bit of glitter. 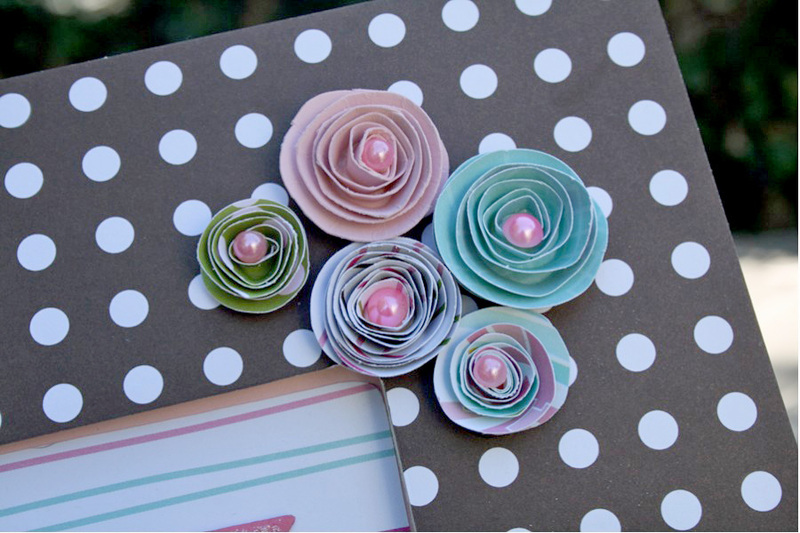 I hand cut the petal and made lots of rolled flowers for the centers of the bigger flowers and for the corner itself. At first, my daughter was upset I wasn't making her a banner. Because it just wasn't FAIR. Does everything have to be fair in your house? I swear, my kids will count the chocolate chips inside their cookies to make sure it's all fair. 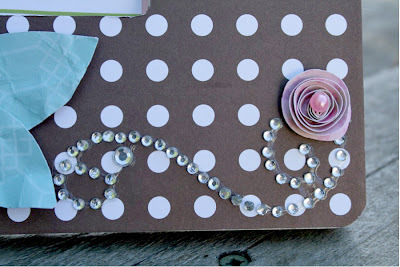 But as the frame came together and I added more flowers and pearls and bling, I think she changed her mind. I dug out a big chipboard K from my stash and painted and stickled it. That's what really brought a big smile to her face, because now it's HER K frame. And she loves it. While she can be a tough critic, the huge smile on her face when she appreciates and likes something is well worth it! 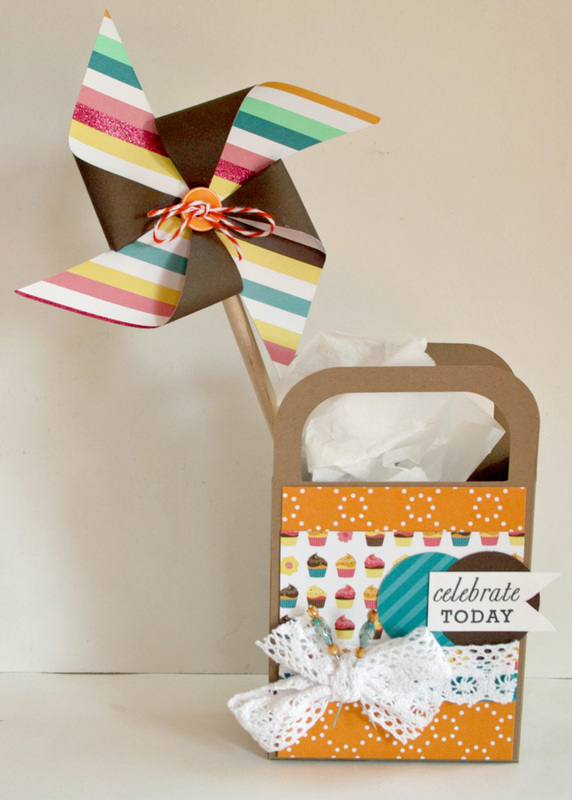 Are you ready for another fabulous Citrus Tree Studio kit?? This one is called Picnic In The Park and it's fabulous!! 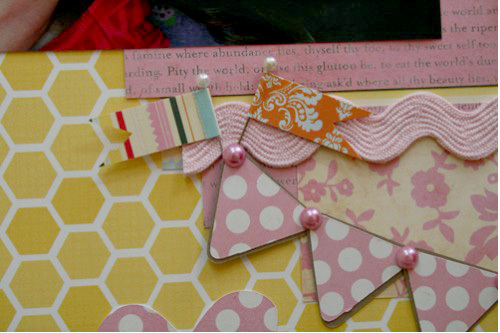 It has lots of Bazzill textured cardstock, Girl's Paperie Jubilee paper, Echo Park Country Drive paper and some great embellishments. I loved it! Aren't those big vintage letters fun?? Such pretty colors in the kit. 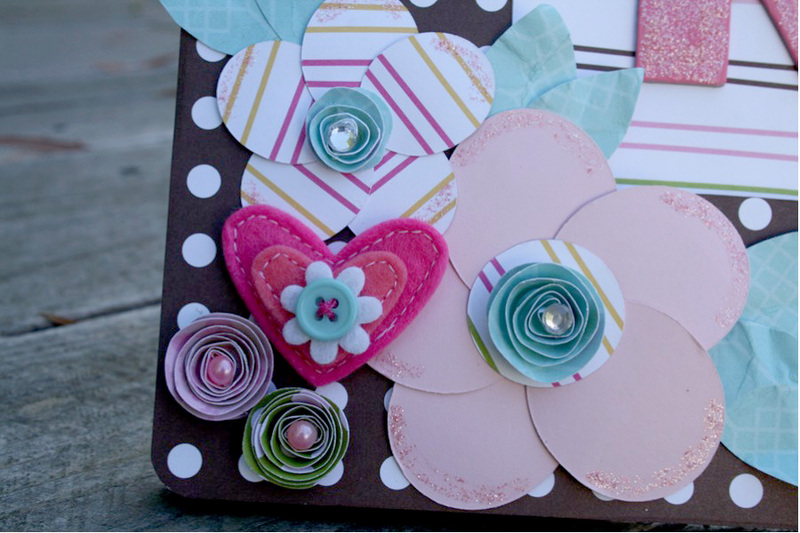 I cut all the hearts with my trusty George Cricut cartridge and put my Martha Stewart butterfly punch to good use. And even in 2011...my banner addiction continues. And look at these ca-ute little flags!!! I have many more projects to show you with this kit. 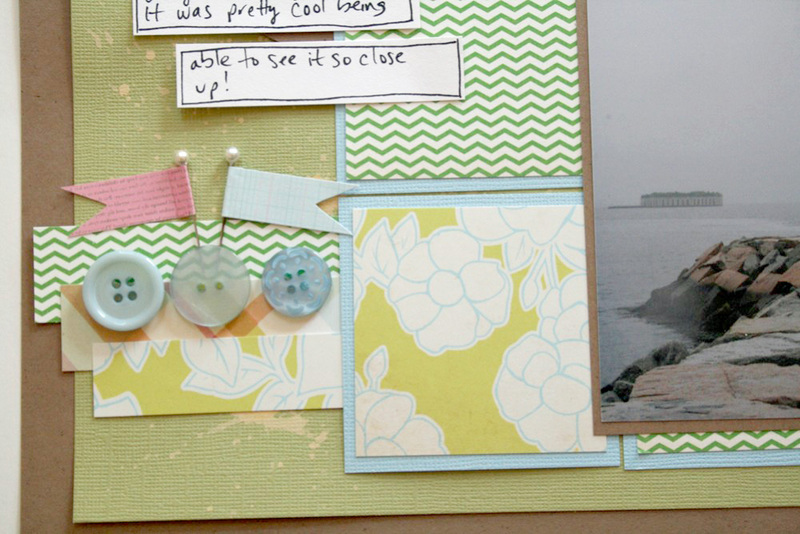 I made 3 layouts and 2 cards and I still have scraps to play with. Yeah CTS!!! Hope you had a great week...Happy Friday! I was honored and flattered and super excited to be asked by Libby to design for PSA Essentials last August. I've had tons of fun playing with their Peel & Stick stamps. There are so many designs to chose from, there's a stamp for every occasion! 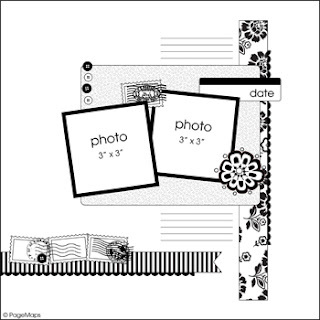 With their stamps I saw my designs on the Home Shopping Network and scored my very first magazine publications. It's been a really fun year!! While my design term is coming to and end, I still will be a contributor to the PSA Stamp Camp blog. So keep checking the blog, there are lots of fun blog hops and giveaways coming up. Here is my last project for PSA...recipe cards. Very appropriate considering how much I love to bake. These cards are 4x6 sized and I printed all the recipes on my computer right onto cardstock. I loved going through all my stamps and finding a stamp to match each recipe. 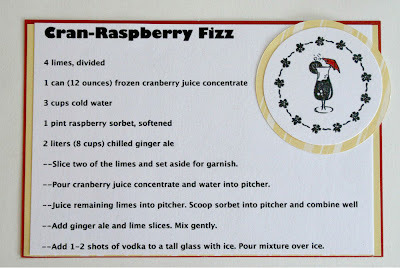 First up...Cran Raspberry Fizz. 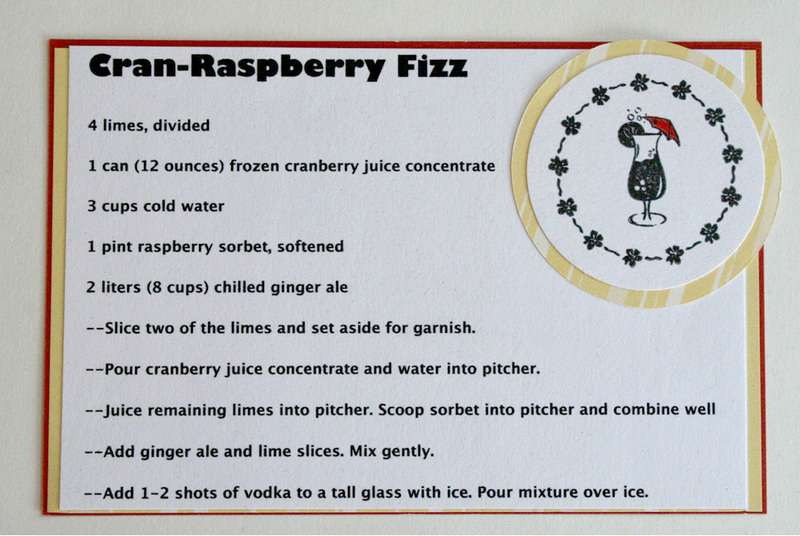 This drink is a favorite for bunco nights! I used a stamp from the Life's a Beach collection. Here's a fun recipe for Halloween. I used their great Skelanimals stamps. These are too cute! 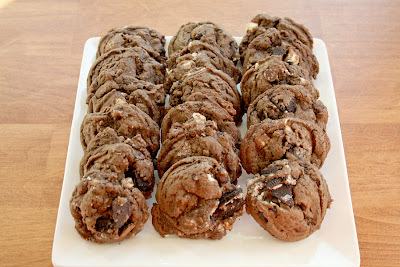 And a great chocolate cookie recipe. The ingredients are on one side and the instructions are on the other side of the card, I couldn't fit it all together. The stamp is from the Smirk Many Moods set. Wouldn't these be a fun gift for a bridal shower?? 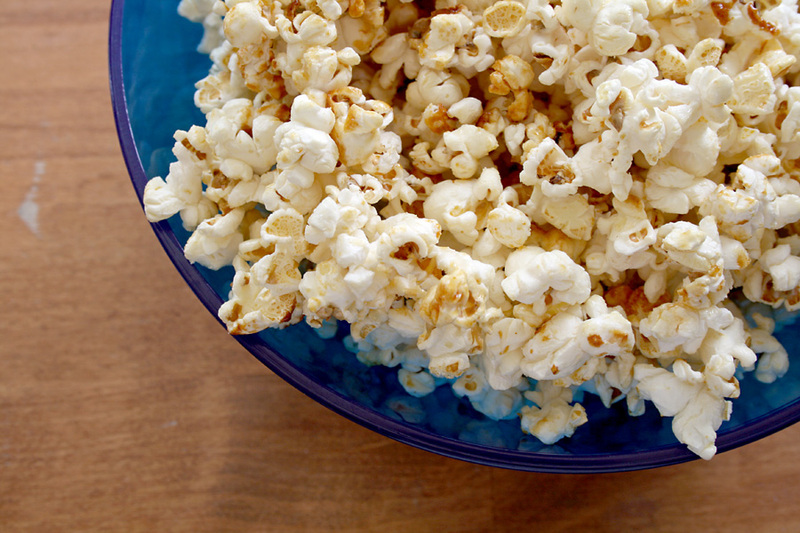 Some great recipes to get the bride started off right. You have to package them up all nice and cute, right? 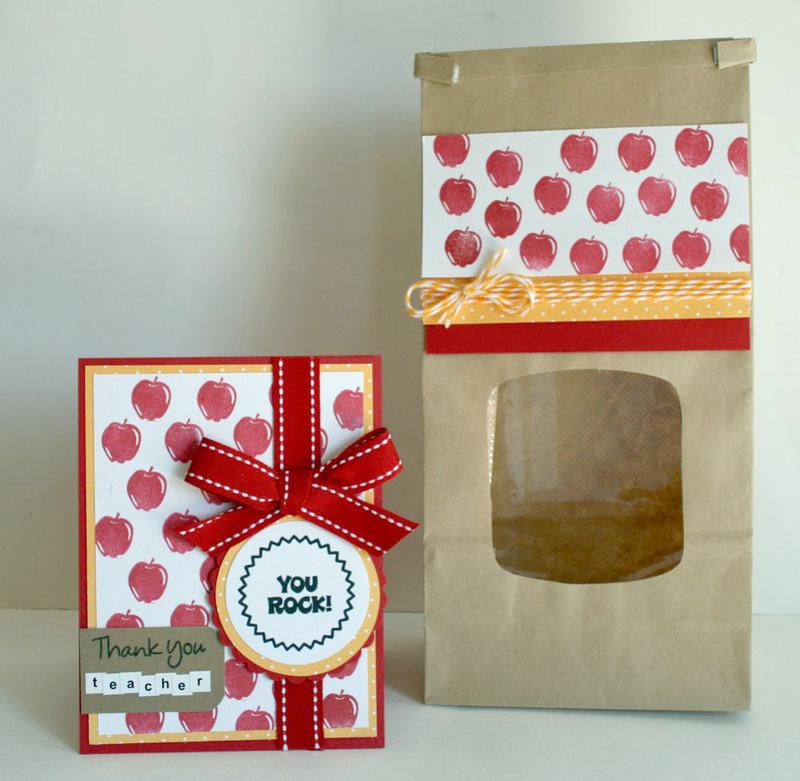 These 4x6 cards fit perfectly into a glassine bag and look great with one of PSA's custom kitchen stamps. You can get any name customized on the stamp. Maybe even get the bride-to-be her own stamp, too! A big thank you again to PSA Essentials for having me on their team. They are coming out with some new exciting products in the future, so keep your eye on the Stamp Camp blog!